The Global Christian Forum, the World Council of Churches and the Conference of European Churches have expressed concern about the safety of two Orthodox Christian bishops abducted in Syria while doing humanitarian work, with one leader saying they are promiment for all people in the war-torn country, not just Christians. The office of United Nations High Comissioner for Human Rights on Tuesday joined the head of the World Council of Churches in condemning the kidnappings. 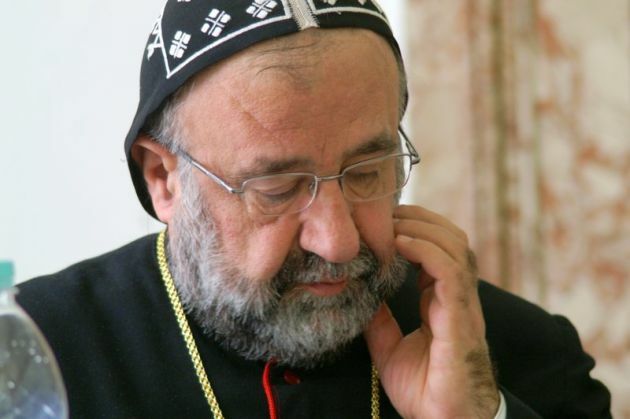 Archbishop Yohanna Ibrahim of the Syriac Orthodox Archdiocese of Aleppo and Archbishop Boulos Yazaji of the Greek Orthodox Church of Aleppo are the two bishops who were kidnapped along the border with Turkey. Syria's State news agency SANA reported Monday that two bishops had been kidnapped at gunpoint in the village of Kafr Dael in Syria's Aleppo Province. (Photo: Reuters / SANA / Handout)Syria's President Bashar al-Assad (R) meets Patriarch John X Yazigi, Greek Orthodox Patriarch of Antioch and All the East, in Damascus, in this handout photograph distributed by Syria's national news agency SANA on Feb. 11, 2013. "An armed terrorist group kidnapped Bishop Yohanna Ibrahim, head of the Syriac Orthodox Church [in Aleppo] and Bishop Boulos Yaziji, head of the Greek Orthodox Church [in Aleppo] while they were on humanitarian operations in the village of Kafr Dael in Aleppo Province," SANA said. The report came on the day the Global Christian Forum released an appeal by Middle East church leaders calling on their co-citizens "to reject all forms of extremism and enmity." The appeal called for the world community to "'to support a Christian presence in the Middle East in partnershipb with other religions" said the secretary of the Global Christian Forum, Rev. Larry Miller. "Global Christian Forum leaders are concerned for the safety of Achbishop Yohanna Ibrahim of the Syrian Orthodox Archdiocese of Aleppo and Achishop Boulos Yazaji of the Greek Orthodox of Aleppo, who were intercepted by armed men as they travelled from Turkish border areas where they were undertaking humanitarian work. "It is understood that the bishop's driver was shot and killed," he said. The secretary general of the World Council of Churches, Rev. Olav Fykse Tveit condemned the kidnappings from Khartoum where he was visiting. "We join with several heads of our member churches and together with them condemn this outrageous violation of human rights and ask for the immediate release of the two archbishops," said Tveit. "Such events are a threat to all religious communities. "Archbishop Ibrahim and Archbishop Yazigi are prominent leaders in the Syrian society," said the WCC leader. "Through their commitment in various local, national and global initiatives they are well known as actors for peace and justice not only for the Christians of Syria but for all the Syrian people." Rev. Guy Liagre, general secretary of the Geneva-based Conference of European Churches, said, "I am deeply disturbed and saddened by the news today of the kidnapping of the Syriac Orthodox and Greek Orthodox Archbishops of Aleppo, Metropolitan Mar Gregorios Yohanna Ibrahim and Metropolitan Paul Yazigi. "We must speak out for religious tolerance, justice and peace; rights all of us work toward and demand for everyone throughout the world. "The archbishops have been warning of the threat to religious tolerance and diversity resulting from the two-year conflict in their country and we must now continue our solidarity, in our prayers and in our work, with all who suffer such intolerance and injustices. May they know that our prayers are with them." he said. Sunni Muslims account for 74 percent of Syria's 22 million people, while other Muslim groups such as Alawites and Druze make up 16 percent. Christians make up about 10 percent of the population, and there are some tiny Jewish communities in big cities such as Damascus, Al Qamishli, and Aleppo. The spokesperson for the UN High Commissioner for Human Rights in Geneva, Cécile Pouilly said Tuesday that the situation in Syria is extremely worrying. "Kidnapping and abduction of civilians is a growing concern in Syria. All kidnapped and abducted civilians should be released immediately. International humanitarian law prohibits the taking of hostages by any party to the conflict," she said.